Sister Grimm: Mama, it's so cold. Mother Grimm: It's very, very cold. Will. Put another log on the fire, lad. Young Will: There isn't any more firewood, Mama. Being a fan of both good old-fashioned fantasy movies and of director Terry Gilliam, I was really looking forward to this one. I was slightly put off when I heard Gilliam's complaints about the constant interference of the Brothers Weinstein, but the director does have a history of being dissatisfied with the production of projects which actually turn out pretty good in the end, so my hopes were still pretty high. So, Gilliam tries his hand at doing a commercial summer blockbuster. And the results are, well, interesting. Primarily he shows that he can produce some great action sequences, and there are some really great visual ideas here, many of which I'll admit are entirely thanks to top-notch CGI work. These are the moments when the director's creative magic appears to shine through, and there's enough of them to make this movie worth watching. Overall it does feel strangely derivative for a Gilliam movie, but I suppose that's to be expected when he sacrifices creative control to the studio. 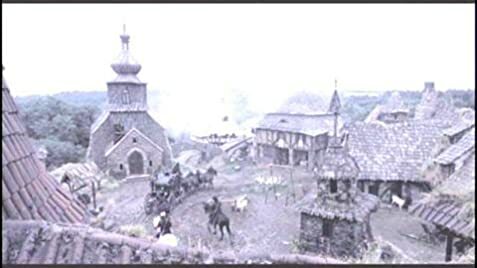 In the past I've heard that Gilliam simply sees himself as a "hired hand" on such projects. However, where it fails is in the mixture of action and drama, in repeatedly placing it's characters in peril whilst also making us care about them. Unfortunately this has been a problem in a lot of these big-budget fantasy/action movies lately, including last years equivalent -- "Van Helsing". The other movie with which this shares a lot in common is Tim Burton's Gothic horror "Sleepy Hollow", which was far superior to either. 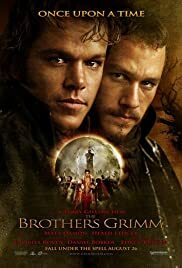 The main problem with the "Brothers Grimm" is that there's little to no character development in the first hour of the movie, and then almost all of the conflict between the characters is suddenly introduced in one scene. This is what we call bad pacing. And the way the characters are written seems somewhat inconsistent (although both Damon and Ledger manage to turn in decent performances all the same), and we never really get a "feel" for their personalities. For your average light-hearted Hollywood fantasy, this is perfectly fine. But from a director with a history of making fascinating, important works of surreal art, this is somewhat short of what you'd expect. 164 of 226 people found this review helpful. Was this review helpful to you?